LOCATION NAME: Car Co-op Office Parkade is now Modo Office Parkade. VEHICLE UPGRADE at The Castings, a blue 2010 Nissan Versa hatchback. TEMPORARY CLOSURE at Fairview Village due to construction. We've been informed by the City that we should have access to that location by the first week of June. In the meantime the black 2009 Toyota Matrix hatchback will be located at St. Augustine's. VEHICLE UPGRADE at Balaclava + W 2nd, a red 2010 Nissan Versa hatchback (as shown in the lead image). NEW LOCATION at Trutch + W 12th, a light brown 2011 Dodge Grand Caravan minivan. The location at Trutch + W 10th is now closed due to the challenges of limited parking on that block. NEW LOCATION at The Hollies between West 48th and 49th Avenues at East Boulevard, a white 2002 Mazda Protégé sedan. This car was formerly at W 15th + Maple, a location now closed due to low local usage. Many of the members using the Protégé actually live in the Kerrisdale area, where there has only been one car for years. Fact: people who cycle to work are healthier and happier employees! This is a great time to encourage fellow employees to get on a bike next week and sign up for Bike To Work Week. Enjoy a free arts, music, and lifestyle festival that encourages a fun, green, and healthy Vancouver. What a great way to celebrate UN World Environment Day. For more information go to Love Vancouver, Love Your Planet. Ready for a more sustainable commute? Get your workplace registered for the Commuter Challenge. There are many ways for employees to reduce their commuting carbon footprint including walking, cycling, taking transit, or working from home. Register here. This year's festival will happen at four sites: Kitsilano, Main Street, West End, and Commercial Drive. In addition to the vibrant street markets, look out for spontaneous street games and entertainment. This is your opportunity to take back the streets! Find out more at Car-Free Vancouver. 1. Our staff has noticed there are more drained batteries lately. Batteries drain from leaving lights or accessories on, or leaving the key in the ignition. Remember: always remove the key from the ignition and return it to the pouch each time you leave the vehicle. 2. Some locations in parkades require a swipe card for entry and exit access (for example, Modo Office Parkade). Swipe cards should be placed in the driver's side sun visor (on the opposite side from the Trip Log). Always having the swipe card in the same place makes it more convenient for all members. Many organizations already know that carsharing works for business - in fact, Modo has over 250 organizations carsharing with us as business members. Businesses big and small carshare because it saves them fleet costs and employee km reimbursements. 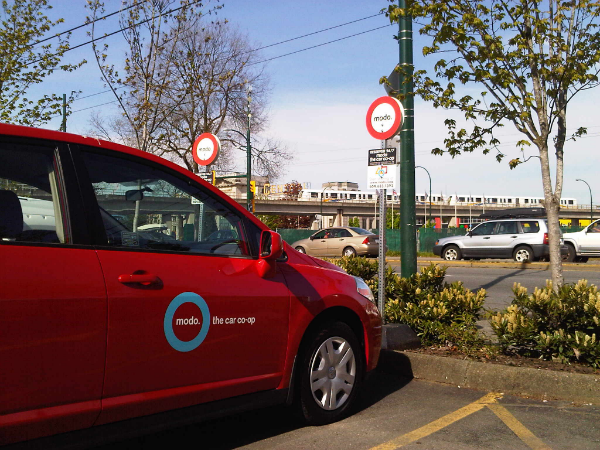 Carsharing also helps them meet their environmental goals. 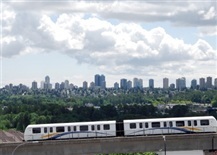 As an added benefit, employees have access to the TransLink Employer Pass Program through Modo. This program can save an employee about 15% on an annual transit pass. So if carsharing is working for you (it probably is) and you know of a workplace that would benefit from it (you probably do), please refer them to check out Modo! Don't forget: any time you refer a new member to us, whether it's a new business member or individual member, you get a $20 referral credit. Vancouver pedestrians, cyclists, transit riders and drivers are invited to a Facebook discussion to give advice to the City of Vancouver and help shape the future of transportation in our city. The discussion takes place between May 31 and June 14, followed by public idea sharing. Sign up closes May 31 so that the discussion groups can start as a team. Discussion groups will focus on key issues - like health, affordability, economy, and the environment. Each group will work together to evaluate strategies and propose directions for the city. Results of the online discussion will be integrated into a draft Transportation Plan by the City of Vancouver, which will then go back to the public for feedback in early 2012. For other opportunities to be involved, click here. Sign up by May 31 to help create the transportation future you want for Vancouver. Carsharing across the border is a-okay. Our fleet insurance covers you to drive anywhere in Canada and the US. Here’s a useful tip: give yourself a bit of extra time before your trip to inspect your booked vehicle – inside and out. 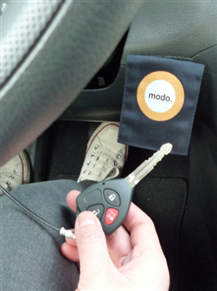 Remove any items that don’t belong to the Modo car. That way, if you’re asked at the border, you can say with confidence that you know all the contents of the vehicle.